Guided boat trips from April 1st till the end of October! Discover Brussels and the new projects in the canal area. Brussels - Sainctelette / 6, av. du Port. 10:00 → 12:00, 13:00 → 15:00 and 15:00 → 17:00. Ad. : 6 € - child: 3 € - child < 3y. : for free. 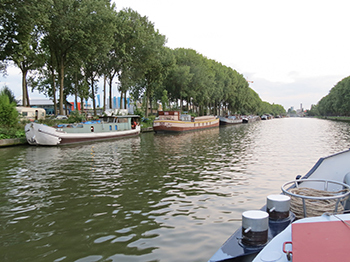 Navigate with the Waterbus, with free time in Vilvoorde. Ad. : 6 € - child: 3 € - child <3y. : for free. Relaxing evening cruise with a FREE aperitif. Tuesday 9/07 - 16/07 - 23/07 - 30/07 - 6/08 - 13/08. Saturday 6/07 - 13/07 - 20/07 - 27/07 - 3/08 - 10/08/2019. Ad. : 13 € - child: 8 € - child < 3y. : for free. Meal possible. Rent a boat for your group! Contact us for more information. Discover Brussels, the harbour and the 'Green Belt' in the north region. We navigate along Vilvoorde, Grimbergen and Humbeek. Sunday 09/06 - 23/06 - 30/06 - 28/07 - 08/09/2019. Brussels - Sainctelette / 6, av. du Port (10:00 - 13:00). Ad. : 10 € - child: 8 € - child < 3y. : for free. Meal possible. Discover the 'new Brussels' by the canal. 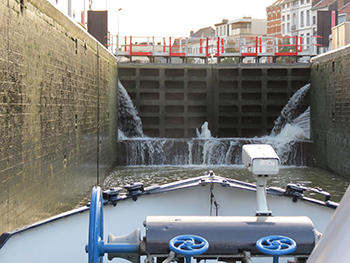 Passage through the locks of Molenbeek and Anderlecht. Sunday 26/05 - 2/06 - 30/06 - 7/07/2019. 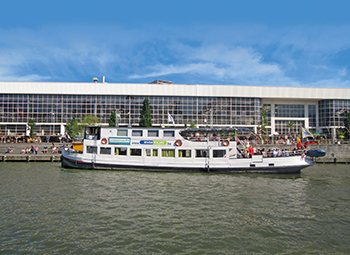 10:00 - Boarding on the Waterbus in Brussels - quai Beco and transfer to the ship Verdi (only on Friday). 10:30 - Boarding on the Verdi in Brussels - quai de Heembeek (nearby Van Praet). 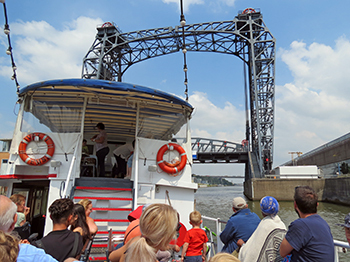 Departure of the boat trip throught the 'Green Belt' and the Scheldt region to Antwerp. 16:00 - Arrival in Antwerp - Steenplein. Guided walk to the central trainstation of Antwerp. Than return by train to Vilvoorde. It's also possible to have some free time after the boat trip, and to make the journey back on your own initiative. Friday 14/06 - 16/08 - 30/08. Saturday 4/05 - 25/05 - 29/06/2019. On Saturdays: when a certain amount of participants is reached, a bus can be arranged for the journey back. Busticket: 10 € p.p. Contact us for mor info. 9:15 - You meet our guide at the station Brussel-Noord (entrance Simon Bolivarlaan). 9:37 - Departure by train to Antwerp. 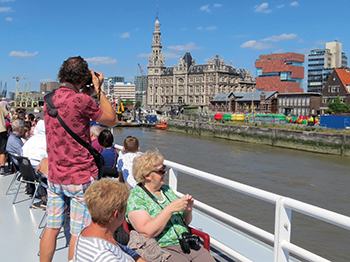 Guided walk from Antwerpen-Centraal station to the boardingpoint of the boat. 12:30 - Boarding on the ship Verdi in Antwerp - Steenplein and departure boat trip Antwerp → Brussels. 18:00 - Arrival in Brussel - quai de Heembeek (nearby tram-busstop Van Praet). 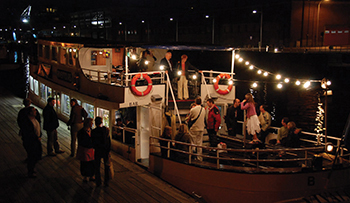 Groups can take the Waterbus to Brussels - quai Beco. You can also make the journey to the boarding point in Antwerp on your own initiative. Tuesday 11/06 - 27/08 - 24/09 - 8/10/2019. Ad. : 25 € - child: 16 € - child < 3y. : gratis. Trainticket not included. Please buy your own trainticket. You meet our guide at the station Brussel-Noord at 9:30 (entrance Simon Bolivarlaan) and departure by train to Temse. 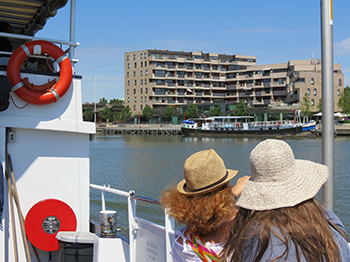 Guided walk from the station to the boardingpoint of the boat and boarding (at 11:25). Boat trip on the tidal Scheldt and the surprising 'Green Belt' to Brussels. Ad. : 25 € - child: 16 € - child < 3y. : for free. Traintickets not included. Please buy your own trainticket. Boat trip from Brussels-centre to the south region. Departure Brussels - quai Beco / 6, av. du Port (19:00). Arrival Anderlecht - Vaartdijk, CDS (20:00 - at 150m from tram line 81 to the centre of the city). Arrival Anderlecht - Veeweide (20:30 - nearby metro COOVI-CERIA). Ad. : 8 € - child: 5 € - child < 3y. : for free. Departure by boat. 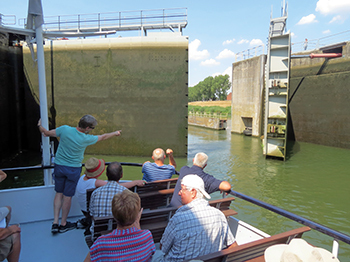 Sail through the southern green edge to Halle, with navigate through the locks of Ruisbroek, Beersel and Halle. Stop in Halle. 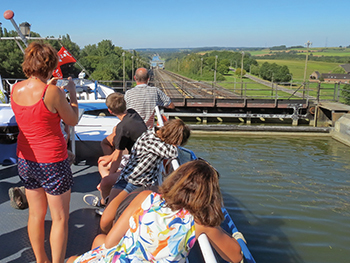 We sail through the light-rolling landscape of the Senne valley and sail through the locks of Lembeek and Ittre. Meal possible. Return by bus. Anderlecht - Veeweide (10:00 - 18:00). All in one trip! Departure by bus to Strépy-Thieu, departure of the boat trip. Boat trip through the boat elevator of Strépy-Thieu, over the Inclined Plane of Ronquières and through the locks of Ittre and Lembeek. Ad. : 30 € - child: 23 € - child < 3y. : 7 €. Navigation only: ad. : 25 € - child: 18 € - child < 3y. : for free. For groups with own transportation.